What has eight legs, a potentially deadly aftermath, and shouldn't be seen anywhere near food? No, not the latest Fantastic Four movie. In fact, it's black widow spider. But that's what a woman in Troy, Michigan claims crawled out of a package of grapes she purchased at her local Walmart Supercenter, according to a report by WXYZ Detroit. Ariel Jackson said she made the disturbing discovery while rinsing the grapes under water in her sink and -- rightfully -- freaked the hell out. She even called 9-1-1. Luckily, her brother and boyfriend killed the damn thing for her, and nobody was hurt. Except the spider, of course. Needless to say, Jackson is laying off the grapes for a while, she said. In a statement issued to the station, Walmart said it is investigating the eight-legged incident and "taking appropriate measures to fully understand what may have happened." 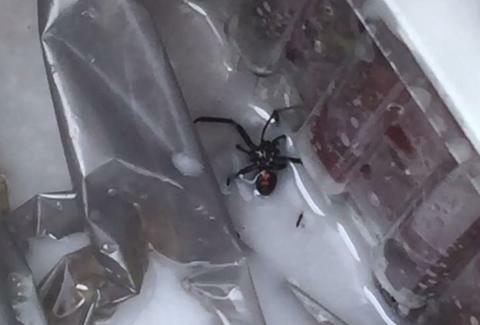 Unfortunately, this isn't the first seemingly innocent package of grapes housing a black widow in the Detroit area this year, as seen in the May WXYZ report above. This is all to say, NOOOOOOOOOOPE! Tony Merevick is Cities News Editor at Thrillist and this only increases his need to thoroughly inspect fruit at the grocery store. Send news tips to news@thrillist.com and follow him on Twitter @tonymerevick.